14 June 2012 – Life Is Such A Sweet Insanity. Today is the first day of my weekend. Tomorrow isn’t the second day of my weekend though, that title goes to next Tuesday. I have a four day work week that starts tomorrow. I need to drive to work for three of those days. Tomorrow is not one of those days. Usually when I have a day off during the week I go on a road trip and explore the back roads of the Empire State, but I decided earlier in the week that I would approach today different and stay local. Ever since starting my latest job over two years ago and commuting a total of 2 1/2 hours a day, I have felt a little disconnected from home life and really disconnected from the neighborhood. Most find reasons to complain about this area of New York (it’s not the most prosperous area of the Northeast by any stretch of the imagination), today I tried to find a reason to boast about it. 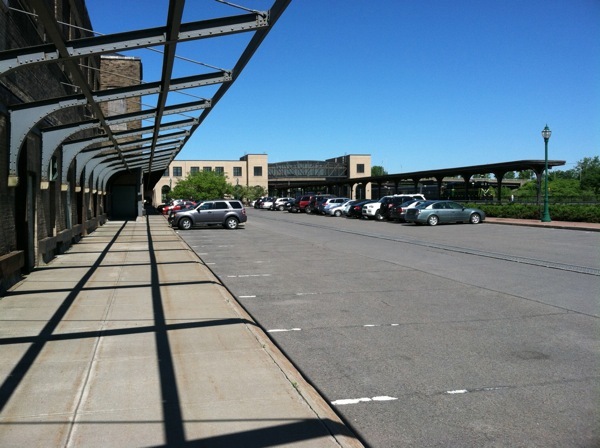 The “main street” of Utica is actually not called Main Street (though we do have one of those), it’s called Genesee Street. Today I drove the length of Genesee Street and admired the houses south of Oneida Square. Many have been turned into law or medical offices, but down towards South Utica the houses are still houses and look quite nice. 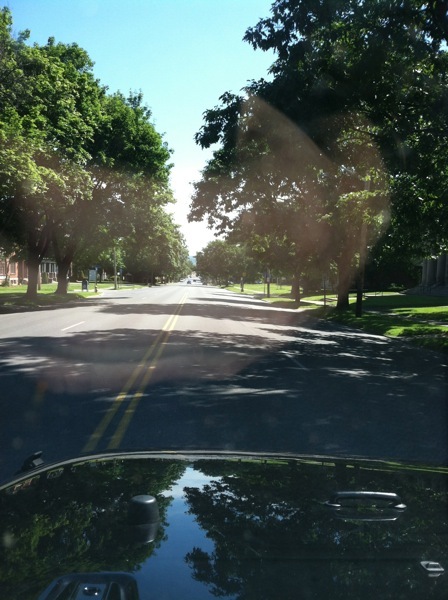 I didn’t want to be labeled a stalker so I didn’t take photos of any houses, but I did take a photo while driving up Genesee Street and it looked a little bit like this. If you look close you can see a tiny reflection of me in the windshield. Today was my “take care of me” day, and since someone at work commented that I needed a haircut (I haven’t shaved my head in a couple of weeks), I decided to go to the barbershop in Union Station, the train and bus station that sits just north of downtown on what is really called Main Street. Near the tracks in the Farmer’s Market area. This building houses many county offices, including the Department of Motor Vehicles, which is right in the main lobby of the train station. The building also hosts a Farmer’s Market every Saturday morning and has a couple of little eateries and a barbershop. 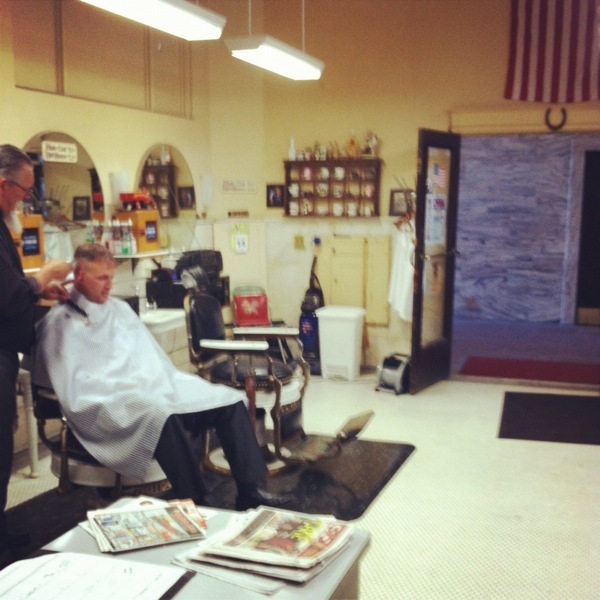 The barbershop is one of only three left in the country that are in a train station and has been in continuous operation since the 1910s. It’s currently owned by a father and son. I met the father today. His name is Leo and he buzzed my hair back down to a shadow. I also took the opportunity to enjoy a hot lather, straight razor shave. During the shave he mentioned that he had never shaved around such a large mustache before but it’s what barbers must have done in the late 1800s. He tamed it a bit with some wax while chatting away. I like Leo, he did a good job, I didn’t feel the razor at all (and I have experienced some heavy handed barber in my time) and I will be visiting him more often. It’s good to support the businesses that are trying to keep the local culture alive. I then stopped at Bagg’s Square Café Express (link goes to the full café which is a couple of blocks away on Broad Street), which is also in the main lobby of the train station and features Starbucks products. We don’t have Starbucks in this area, only folks that sell Starbucks products. I picked up a Venti Unsweetened Green Iced Tea and it was delicious. The cool thing about that experience was that I was able to pay using the Square app on my iPhone. My photo appeared on their screen, I told them who I was and they charged it to the credit card linked to my Square account. I could have added a tip if I wanted to but I opted to drop some cash into their tip jar instead. No credit card, no numbers exchanged, just my photo and that’s it. That is wicked cool to me and I wish more businesses would adopt the same approach in this area. Earl and I enjoyed a nice lunch together and then I spent the afternoon cleaning my home office, joining a conference call at work (sometimes you gotta do what you gotta do) and then visiting my chiropractor to get my neck and back back on track. My mind, body and soul are soaring today. And I owe it all to my home turf. Sometimes it’s good to stop and see what’s close to home instead of venturing off into faraway lands.